Welcome to the August Bite, the monthly e-newsletter for the Nanoscale Informal Science Education Network (NISE Net) and community. Science in the News - Nanoparticle Takes Photodynamic Therapy to Deep Tumors; Now You See It, Some Day You Won't: Scientists Get Closer to Invisibility; Synthetic Biology for Space Exploration; Easy DNA Editing Will Remake the World. Buckle Up. Are you interested in reaching underserved audiences in your community that you aren't currently engaging in nano? The Museum & Community Partnerships project provides an opportunity for partners to broaden their reach and engage underserved audiences by building or expanding local community partnerships, while helping community organizations provide high-quality STEM learning experiences for their audiences. To better employ these museum and community partnerships, an outreach kit of professional development and public engagement resources will be available as both a physical and digital kit; 100 physical kits will be made available nationwide. The application to receive a free physical kit will open September 15th; applications must be submitted online y Friday, November 13th. Don't miss out on this opportunity! For a more detailed introduction to the project and more information on the physical kit application process, join the September 30th Online Brown-Bag Conversation: Planning a Museum and Community Partnership Project. Between August and September, at eight pilot sites across the U.S., Building with Biology Activities and Conversations about Synthetic Biology events are taking place and bringing scientists and members of the public together to consider societal implications of this fast-growing field [view schedule of upcoming BwB events]. A free physical kit will be available to 200 sites nationwide to host a Building with Biology event of your own during the summer of 2016. Time to start thinking about scientists in your community to invite and engage with the public for these activities and conversations! Kit applications will open later this fall and will be due in early 2016. At the intersection of youth-serving and community-based organizations seeking to provide high-quality STEM learning experiences to their audiences and for science museums seeking to reach underserved audience not currently engaged in nanoscale science, engineering, and technology, there presents a unique and rich partnership opportunity for local community organizations and science museums. Since 2010, the Milton J. Rubenstein Museum of Science & Technology (MOST) has partnered with the Onodaga County Public Library's Summer Reading Program to provide science programming relating to their summer reading program at 32 libraries in Onodaga County. This year's summer traveling science program, "Superhero Science: The Power Behind the Hero!," corresponds to the library's summer reading theme "Every Hero Has A Story." Using science to explain supreheroes' powers provides an engaging and exciting learning experience for children, and helps to continue to pique their interest in STEM topics by making connections between something they already have background knowledge in (superheroes) and science! 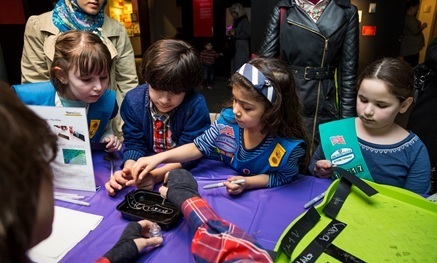 In addition to partnering with local libraries, the MOST collaborates with Cub Scouts and Girl Scouts in their community by providing overnights at their museum with workshops designed to satisfy badge requirements. Museum educators' are able to work with scout leaders to provide programming that meets their scout's needs. During MOST's 2015 NanoDays, a Girl Scouts troop was able to engage in nano by watching an Alice in Nanoland dramatization and through hands-on activities. Continue to the full Partner Highlight to read more about MOST's community-based partnerships and educational outreach programs with middle school students, teachers, and visitors with sensory challenges. 2015 NISE Network-Wide Meeting - Digital versions of the 2015 NISE Network-Wide Meeting program and attendee lists, plenary presentations, and select photos from the meeting are available online. 2015 NISE Network Meeting Concurrent Sessions - NISE Net's Network-Wide Meeting included 28 concurrent sessions on a wide variety of topics focused on engaging the public in nanoscale science, engineering, and technology. A list of concurrent session topics along with many of the presentations are available online to download. There is no charge to participate in any of these online brown-bag conversations. Come learn more about how members of the NISE Net Evaluation team adapted basic data collection methods to support various phases of NISE Net Evaluation Studies. You'll gain new perspectives on how to implement basic methods, an understanding of the factors to consider when trying these in your own unique environments, and a sense of empowerment to work with methods that will benefit both study participants and your organization. This conversation will provide an introduction to NISE Net's new Museum & Community Partnerships project, which will support partners' efforts to develop or improve existing partnerships with local community-based organizations, through which these partnerships will help extend their reach to underserved audiences and help community organizations provide high-quality STEM learning experiences to their audiences. Presenters will walk through the application process for receiving a physical outreach kit (100 copies will be available nationwide) and we'll also hear first-hand from a NISE Net partner institution who has built a long-standing partnership with the YMCA. A new nanoparticle could make it possible to target cancer cells deep in the body as part of a treatment called photodynamic therapy (PDT). Conventional cancer therapies like chemotherapy and radiation can damage healthy tissue while targeting tumor cells. Existing PDT has used visible or near-infrared light, which can only penetrate a few millimeters through tissue, meaning it's only useful for tumors near the surface of the body. Researchers are excited about this newly designed nanoparticle because it can be injected into a patient's bloodstream or applied to the skin and can be activated with low doses of X-rays that are able to reach tumors deep in the body. The new treatment has been tested in mice, the next stage is to tailor the nanoparticles for clinical trials. NPR Morning Edition reports on how through the use of lenses, science is finding ways to bend light making objects appear invisible. Online Brown-Bag: The International Year of Light 2015 - What's Nano about Light? Mars is a long way off - literally speaking - but the approximately 34 million miles between Earth and Mars isn't deterring scientists from planning a mission to Mars. NASA estimates, depending on technology used, that travel to Mars will take about eight months, with astronauts spending anywhere between a few weeks to over a year on Mars before returning to Earth. Instead of packing and moving all the necessary living essentials, scientists are proposing the use of synthetic biological processes "to make extraterrestrial travel more practical and bearable." For example, synthetic biology could be used to help reuse crew waste, to create fuel, use microbes to sustain plant-based farming and engineering them to produce pharmaceuticals. → Easy DNA Editing Will Remake the World. Buckle Up. The gene-editing technique, CRISPR-Cas9 (the first term stands for "clustered regularly interspaced short palindromic repeats," which is a description of the genetic basis of the method; Cas9 refers to the protein that makes it work), is a scientific breakthrough in genome editing, but is causing pause among some because of the power - to quickly and easily alter DNA - that this technique provides. The applications of CRISPR are far ranging from agriculture to medicine, and has the potential to change the world, but the legality, ethics and societal implications remain less clearly defined. As one researcher notes, "You can't stop science from progressing...Science gives people power. And power is unpredictable." Read the Nano Bite e-newsletter online at /newsletter/nano-bite-august-2015.